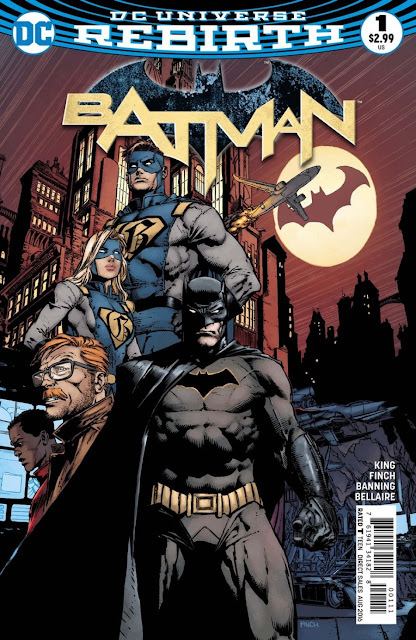 It's never easy following one of the most acclaimed duos in Batman comics history but Tom King (The Sheriff of Babylon, The Omega Men) and David Finch (Wonder Woman) are up to the task. There's no topping Scott Snyder and Greg Capullo who made the iconic Dark Knight an extension of Gotham City itself in eloquent and literary ways. King goes back to basics and propels the next era of Batman with an all-out action extravaganza. No time for apologies, recaps, or flowery descriptions of the caped crusader, Batman is a man of action after all and he's got an impossible task ahead of him. With the Justice League M.I.A. it's up to him, Alfred and Duke Thomas to try and save a jetliner from crashing into downtown Gotham. It's been hit with a missile by a mysterious assailant and it's a race against time and physics to set it down safely. As implausible as that may sound, King sells the premise with an urgency and a confidence that will make you a believer. Batman has shaken off his moody exterior and is way more collaborative. He takes Commissioner Gordon's intel and enlists Alfred's guidance and dry wit with the technical expertise of Thomas. The rest is a high-flying pulse-pounding adventure that sees Batman at his most heroic and surprisingly his most vulnerable. We've known Bats to be aloof, distant, brooding, and simply a jerk at times. King so far has shown him to be more trusting of others and even able to recognize his own mortality. The man with a plan and counter-plan for everything and everyone admits he's flesh and blood. He risks it all for justice, for saving others, yet gadgets will only get you so far. It's an interesting admission for a hero capable of taking down some of the most powerful villains (and heroes) the world has ever known. In King's first issue Bats life already hangs in the balance making the new series instantly addictive. David Finch does a stunning job with the array of cityscapes he has to create from various angles with extraordinary detail. Matt Banning's inking adds depth through precise shadowing. And superstar colorist Jordie Bellaire emphasizes the glow of downtown with bold yellows and oranges that match the fiery trail of flames from a falling airplane. The new costume takes some getting used to but looks good overall. The orange outline of the bat and the purple cape are interesting changes but not sure they were necessary. 'Batman' under the new creative team usher in a new era of a more relatable Dark Knight thrust into action with large-scale heroics we're not used to seeing. It's an accessible entry point for new readers that won't disappoint long-time fans either. Following a legendary creative team isn't easy but King, Finch, and Bellaire are off to a great start with big action, mystery, and a major cliffhanger.